YouTube TV, the streaming TV service that Tim and I can’t shut up about, is getting a new feature this week that will let you customize its channel order or Live Guide. 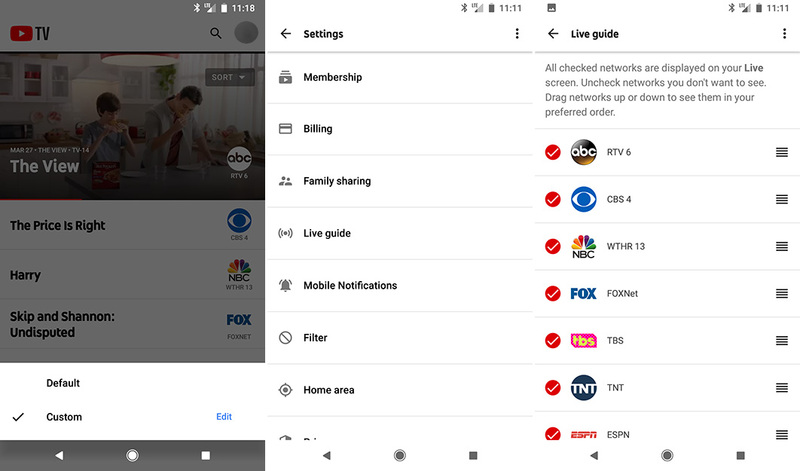 Buried in the Settings, a new Live Guide option is rolling out now that lets you not only re-order your channel line-up in YouTube TV, but remove channels as well. As you can see in the screenshots here, you’ll get check boxes next to channels in case you want to hide or show them, along with buttons to drag and drop into an order you prefer. Then, once viewing your guide, you’ll now have a button that will let you toggle between the “Default” or the “Custom” Live Guide you just setup. This really would have come in handy during those first couple of NCAA Tourney rounds where I had to dig deep in the depths of Earth’s core to find Tru TV. I did survive, but you get the struggle. Again, the feature is rolling out now and will be available on the web and in the YouTube TV app. It does not appear to be triggered by an update and is instead a server-side change. AT&T Galaxy Note 8 Getting Oreo Update Right Now!